Description: Clearance Sale Item! Price Reduced! Three Blind Mice Blu-spec CD reissue series! Limited paper sleeve edition! 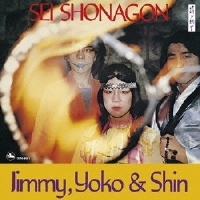 Jimmy, Yoko and Shin, a trio of young and mercurial musicians featured in this album was the winner of the First Japan Jazz Grand Prix in 1978, the first open jazz contest in Japan in which 66 group parcitipated. Their concept of incorporating elements of traditional Japanese music into jazz was unique at that time, and together with their use of synthesizers and multiple instruments, it sounded traditional, futuristic and avant-garde at the same time. Eager to find new talent and and to push the envelope, Three Blind Mice was quick to offer the group an opportunity to record. Notes on the song titles: Sei Shonagon was a female writer who lived ca. 966-1025. Gion Shoja is one of the first words that appear in a story written in Kamakura Period (1185-1333). Soran is a traditional melody from the northern region of Japan. Produced by Takeshi Fujii. Recorded at Aoi Studio, Tokyo on June 22 and 23, 1978. Blu-spec CD is compatible with all regular CD players. Paper sleeve special limited edition.